This was to replace the dud battery on our Kubota lawn tractor. Great price, fast delivery and outstandingly well packaged. Highly recommend Tayna. Fits perfectly and starts my car plus was cheaper than any other batteries I could find. Very pleased. My experience of purchasing this battery from Tayna could not have been better. The process was simple and efficient. The battery was delivered the next day at exactly the time given. My first choice will be Tanya in the future. 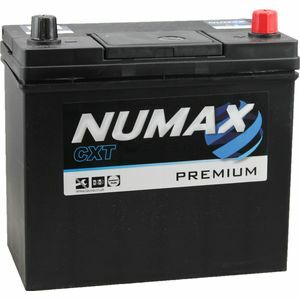 had batteries from tanya before = best peoplet o deal with - speedy good price wide range Numax are good. Product came next day as stated. packed well. 5 minutes to install and the car started straight way, battery comes charged. Would not hesitate to use them again, installed in a 1994 Mazda MX5 for Â£50.... brilliant value. Very pleased with the competitive price and the swift delivery. With batteries it is difficult to review performance as you can only really assess performance after a couple of years. The delivery from Tayna was brilliant under 24 hours! Battery fitted in my MX5 easilly, hopefully I will get many years good service from it. The right battery for my car. Great communication and service from Tayna. Packaging was excelent, delivery excelent, have not really had time to access the battery itself. All Ok so far though. Great product and first class service. This is the only way I would buy a car battery in the future. Excellent! This is a terrific battery and the service you provide is amazing. I ordered the battery late morning and it arrived the next day - fantastic!